Joakim Noah, nursing his own foot and hand ailments, paused and went silent after talking to reporters as Derrick Rose stepped from the shower into the locker room late Monday night after the Bulls had defeated the Indiana Pacers 92-73. 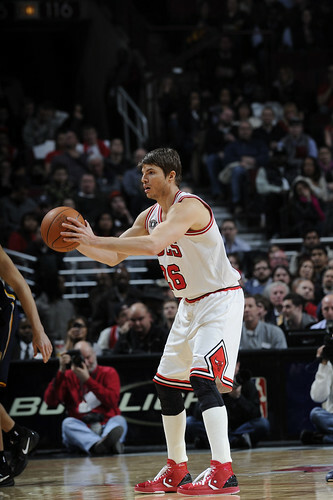 Rose shuffled toward his locker stall, moving cautiously, his right arm hanging limp. Rose, seemingly the fastest man alive, certainly with a basketball in his hand, would fold himself into his chair and begin trying to pull his socks on using only his left hand. 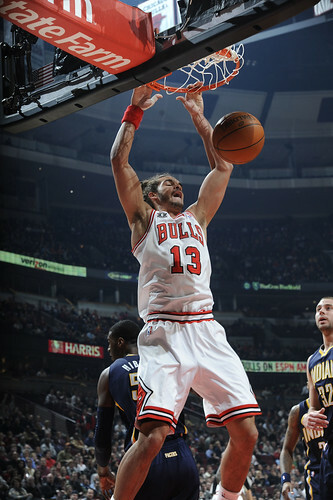 Noah would quickly, though, try to lighten the mood because he’s been having a ball ballin’, as it were. 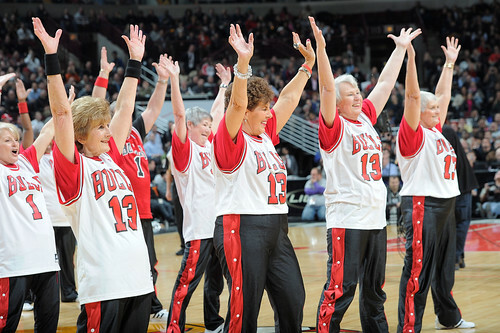 That was six straight wins for the Bulls, now 15-8, playing their best basketball in four years, five straight opponents scoring 90 points or fewer and four of the last five shooting below 40 percent. And, no it wasn’t as even coach Tom Thibodeau feared a fracture or as Rose feared a break or who knows what. 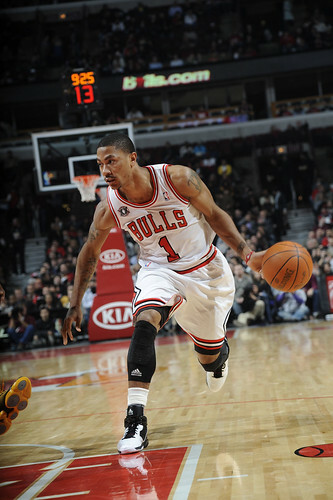 “I thought it was going to be worse than that,” Rose said as he awaited the X-rays, which were negative. “It knocked the wind out of me. Most people, when they jump that high, they usually get hurt pretty bad, but thank God, I didn’t break anything. So nothing is broken, just a sprained wrist, confirmed trainer Fred Tedeschi from Rose’s attempt to basically jump over Brandon Rush with 1:56 left as the Bulls were pulling away after leading by just two earlier in the fourth. “All the bones are in the right place,” said Tedeschi. Which is a relief to everyone as Thibodeau saw his rookie season becoming a disaster and management began considering the lottery. Don’t kid yourself. That’s how good Rose has become and how fragile this roster is without another true star talent to make plays. Look, when Michael Jordan broke his foot in 1985 and missed 64 games, the Bulls ended up winning 30 games, eight fewer than in his rookie season. And that was with winning six of their last 10 once Jordan returned. Rose is listed as questionable for Wednesday’s game in Toronto. Sorry, but, to me, he should not play, and perhaps not even Saturday at home against the Clippers. He missed a game last month in Denver—though I shouldn’t bring that disaster up again—though replacement C.J. Watson had 33 points and the Bulls lost at the buzzer to a Carmelo Anthony heartbreaker. This is a soft week for the Bulls with just two games until a busy Christmas week leading up to the Christmas Day game in New York against the hot Knicks. Rose will likely want to play Wednesday because that’s who he is. You can wonder what he was doing in the game with under two minutes left and a 13-point lead, or why then he was trying to scale Rush at the basket after beating T.J. Ford on the perimeter with the game in hand and Rose with 17 points and 12 assists to complement Carlos Boozer with 22 points and 18 rebounds. But coaches play players who want to play, and Rose even refused to come out after he shot the free throws, declining to give the obligatory fist bumps with his right hand after he missed the first one. He said he wanted to be in earlier because the game was still being decided. And Rose is who we know he is. He doesn’t take plays off and when he sees a chance to jump over someone, why not. Like a kid and a diving board. He’s always going to try. Because it’s there. Plus, Thibodeau relies on his regulars with Rose, Noah and Luol Deng, the latter with 15 points and nine rebounds, all in the league’s top 16 in minutes played. So I would declare Rose out for the 9-15 Toronto and probably the 5-20 Clippers. Get Rose a week off and ready for the next big stretch of games, four in six nights around Christmas. Let’s see the rest of this roster for now. 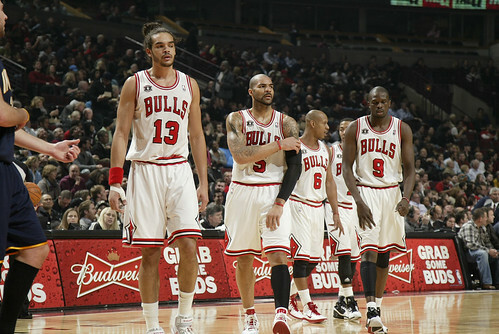 It certainly ought to be able to compete with those teams without Rose. So maybe they won’t win, or maybe they rise to the occasion. They have before as they were a few free throws away from a terrific victory in Denver. And that was with Boozer still out with his broken hand, and Boozer sat after the game with his own right hand wrapped and acknowledged the discomfort is not going away anytime soon. But nothing is more vital to this Bulls team–and my aesthetic view of basketball–than Rose playing at a high level, or certainly healthy. 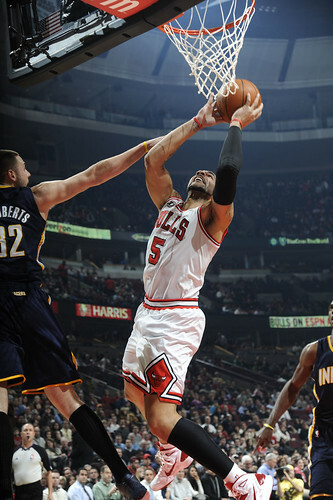 It was sadly apparent Monday after the Bulls blasted out to a 25-8 start. Rose hit a pair of threes and not only is he making them now, if you watch his form and shot he’s probably the best perimeter shooter on the team. The only issue I have now with Rose’s shooting is he doesn’t shoot often enough. He’s good enough to average 25 to 30 points and still double figures in assists if other guys could make more shots. They were Monday, especially Boozer, who had an excellent game as the Pacers tried an old trick with him by playing seven footer Roy Hibbert on him. The book on Boozer, similarly like it was with Ben Gordon, is to crowd him with size, someone with long arms to cast a shadow over his shot. 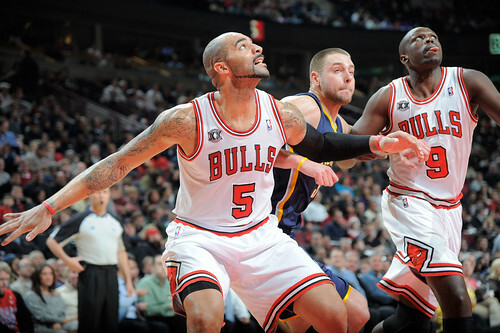 But Boozer simply stepped back or made a nice drop step to get inside Hibbert, and the Bulls were off and running. 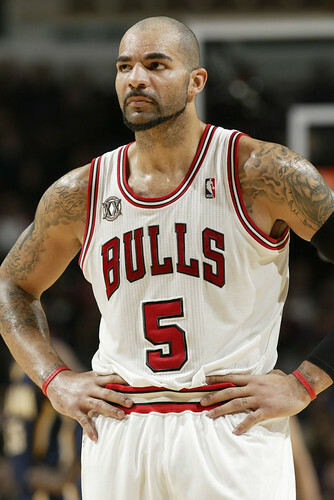 Boozer seemed on that course, though the Bulls stalled when Rose got a second foul and departed with 4:17 left in the first and the Bulls ahead by 17. Indiana, now 11-12, closed with a 10-2 run by dominating the boards, being the aggressor while the Bulls fiddled and faddled with too much individual play. That continued into the second quarter with Mike Dunleavy blitzing Korver and with the Pacers going with a smaller, quicker group, Boozer losing Josh McRoberts on putbacks. As a result, the Pacers surged ahead 37-33, a 21-point turnaround in 13 minutes. Rose returned early in the second, but couldn’t hold off the Pacers rush until he drove with about five minutes left and pushed off a short runner, was seemingly hacked and with the usual no call. So he finally said something and got his first technical foul as a pro. On the Bulls next possession after a Pacers’ 24 second violation, Rose drove, scored and got a chance for a three point play. Is that really what it takes? Kids are watching. Is this the lesson we want to teach them? Still, Rose would shoot just three free throws, and perhaps the referees just didn’t want to embarrass the Bulls as they missed 10 of 20 free throw attempts to continue their season long futility. So as the Bulls headed to halftime back up 43-41 on Korver and Rose threes to close the half, the league’s second leading rebounding team had been outrebounded 27-19. 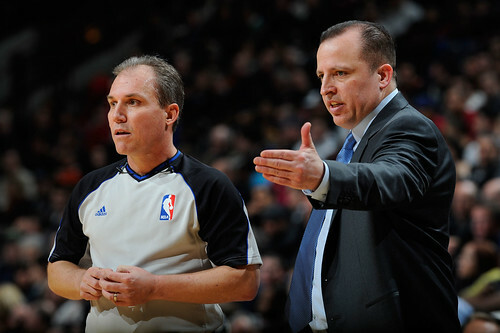 Thibodeau apparently made the point. The Bulls, especially the guards with Keith Bogans and Deng not leaking out and staying home to rebound, got on the boards and the Bulls began to regain control of the game. The Pacers stayed with Hibbert on Boozer, and Boozer was making his shot, posting up, running some nice pick and roll with Rose and hitting the boards as well. The problem this Bulls group sometimes has is it wants to run because it doesn’t score easily and needs some easy points. So perimeter guys leak out, which the Pacers took advantage of to hit the boards and go 13-0 on second chance points in the second quarter. Ouch. So you can’t both run and come back and rebound. What Thibodeau wants is whomever gets the rebound to head up court fast, especially Rose, thus having the rebounder as a push man to get into a break, and the Bulls got back to that after halftime, particularly Deng who got some big rebounds in traffic. Also, Ronnie Brewer, who is fitting well into his role, had nine points and three more steals. 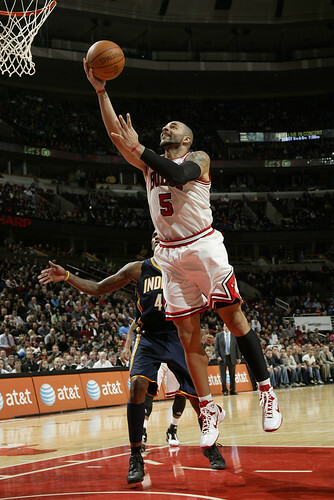 The Bulls pulled away to a 65-58 lead after three and a decisive 16-8 margin on the boards, Deng cashing in a three for a 59-50 lead after Boozer and Noah got tough offensive rebounds on the same possession. But the improving Pacers are a good defensive team, especially when they went smaller and forced the Bulls into late shot clock attempts with aggressive closeouts. But the Bulls were hustling as well. Brewer got a loose ball for a reverse layin as he’s unusually good around the baseline to make it 73-67 with about seven minutes left before a bit of a gasp went up in the sellout crowd as Rose went down as he was trying to bust out with a rebound and stepped on Gibson’s foot. “Thank God he had (ankle) braces on. It helped him a lot,” said Tedeschi. But he has his smile. 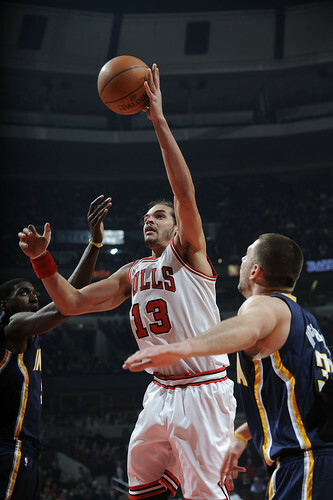 The Bulls began to pull away at that point as the Pacers went with shooters. They should have gone with makers and would finish three of 19 on threes, one of 10 after halftime. Boozer and Rose applied the finishing touches, though it was not art until there came the gasp when Rose began to fly over Rush, who stepped up to draw the charge and at the top of Rose’s leap he came crashing down. 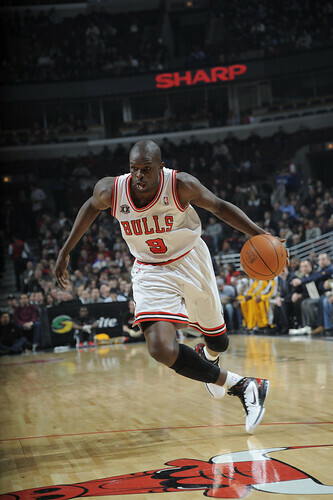 It did look bad and Tedeschi and Thibodeau rushed across court to Rose, who stayed down in pain for a few minutes. When he rose he clearly was in pain, though Rose does live this “mind over matter” mantra, that you can play through anything. Not only is he good, but he’s too good to believe. He made the free throws, declined to still leave as the game was long out of reach and at the close could only exchange hand shakes with his left hand, his right arm hanging down. And they need a healthy Rose to get there.